Vegan meatballs are the new "it" food in the culinary world. 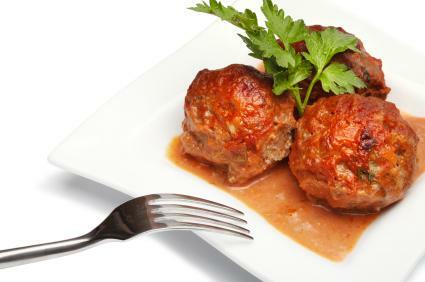 Even those who don't refrain from eating animal products covet the tasty, meatless meatballs. The ingredients used in the meatballs are seasoned to taste like meat; however, they don't compromise a true vegan diet. Since die-hard vegans shun fish, eggs, and dairy products, in addition to animal ingredients, authentic vegan meatballs rely on substitutes, such as non-dairy vegan cheese and egg alternatives to help bind the soy, nuts, lentils, or legumes. There's a vast variety of vegan meatballs available in the United States alone. While most are comprised primarily of soy protein, different recipes call for additional ingredients to add texture and flavor to the finished dish. Many home cooks have also taken to putting a unique spin on traditional vegan meatballs by adding exotic ingredients to reflect different cultures' favorite flavors. For example, to make Middle Eastern vegan meatballs, you might use chickpeas as the base and add an array of herbs and spices to give the dish some heat. Other options include mixing black, kidney, or cannelloni beans into a soy-based vegan meatball base or making the balls from ground nuts and adding flaxseed powder to increase the protein and omega-3 fatty acid content. Making meatballs is a viable option for even the least experienced cooks, as most recipes are so easy to follow. The cooking method is simple as well and can be modified to give you more flexibility in the kitchen. For example, you have the option of frying the meatless meatballs or simmering them in a simple tomato sauce. When they are done, ladle them over a bowl of your favorite pasta or tuck them into a crusty loaf of French bread to make a vegan sub. The perfect meatless meatball should have a glossy appearance and a slightly crumbly texture. It should be moist but not chewy, and from the outside, it should look extremely similar to a real meatball. It's even sometimes possible to fool carnivores into thinking they are biting into "real" meatballs if you cook the vegan treats just right. Ike's Place in San Francisco, California: The award-wining sandwich shop offers a "Vegan Meatless Mike" dish made with meatless meatballs. The Breakroom Café in Oakland, California: The small café serves up homemade "meatballs" on French bread topped with vegan mozzarella. Buddha Hut in Worcester, Massachusetts: This restaurant makes a to-die-for Italian meatball soup just for vegans. The Spiral Diner & Bakery in Dallas, Texas: Sells a crowd-pleasing dish called "Sketti 'n Meatballs," which features soy vegan balls served on spaghetti with homemade marinara sauce and topped with pine nuts and pesto. Other places take meatless meatballs to new heights, such as Caravan of Dreams in New York City. The Big Apple restaurant offers "Live Love Boat," which stars savory meatless meatballs made from almonds and Brazil nuts topped with fresh tomato slices on a Napa cabbage leaf boat slathered with mango chutney marinara. The meal is so filling you won't even miss the meat.